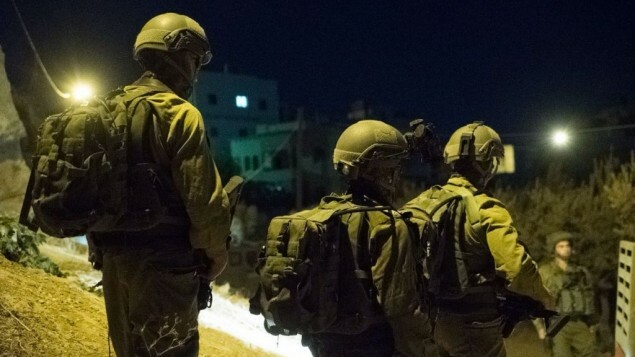 An IDF soldier was lightly wounded in his knee Thursday night in a shooting attack at a checkpoint near the West Bank city of Tulkarem. Medics treated him at the site. According to initial reports, he was struck in the knee by ricocheting bullets. Security forces located the source of the fire, the IDF said. Several shell casings were found at the scene. Troops have launched a manhunt for the suspected shooter. Earlier Thursday, authorities reported a suspected drive-by shooting at the guard post outside the settlement of Ofra, which lies northeast of Ramallah. Nobody was injured in the incident. Also Thursday, IDF troops foiled an attempted stabbing attack by a Palestinian assailant near Ofra, the army said. The assailant was shot dead at the scene. The Palestinian, carrying a knife, approached the servicemen near a bus stop outside the settlement, where the soldiers had been standing guard. The assailant was identified by the Palestinian health ministry as Maan Nasser al-Din Abu Qara, 23, from the nearby town of Mazra’a al-Qibliya.